An early prototype of L’Garde solar sail is evaluated in a vacuum chamber at the NASA Glenn Research Center’s Plum Brook Facility in Sandusky, Ohio. This test article is a quarter the size of the sail the company plans to fly in 2016. 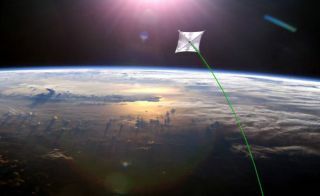 NASA chose California-based L'Garde, Inc. to build Sunjammer, which takes its name from a solar-sailing spaceship in an Arthur C. Clarke short story. Though the unfurled sail covers one-third of an acre (0.13 hectares), it packs down to the size of a dishwasher. It's made of a material called Kapton and weighs just 70 pounds (32 kilograms), NASA officials say.